Mapping is hard … it takes a lot of time and effort to produce even one battle-map, let alone enough maps for a whole adventure. Which is why I want to call out out what I think is one of the best Patreon sites out there: Heroic Maps…. An adventure supplement for the MOTM. I am definitely not what you would call an ‘off-the-cuff’ DM! The happiest DMing I do is when I’ve prepared well, both in terms of the session that I think I’m going to run, and for those parts of the session that I’m not really expecting to happen, but that might crop up if the PCs go off-piste. If I’ve done this, I’m generally pretty flexible and let the game flow; if not, I’m more likely to try and keep the party on a certain path. I’ve just got back into running the Amber Pendant campaign, a solo campaign with my son, following a long (almost 2 years) hiatus due to many life things, including GCSE exams, as discussed here. This campaign has always had Icons, even when we were playing 4E. However, on re-starting this campaign, we’ve decided to convert fully to 13th Age. So how do I reconcile the improvisational concepts of 13th Age with my need to be prepared? Well, I simply take the designers’ advice on p179 of the core rules: If you aren’t entirely comfortable improvising on the fly, consider asking the players for story guide rolls at the end of the session to prepare for the next game. This suits me much better. I have found myself mulling over the Icon rolls for several days between sessions, and this has lead to some interesting changes in the encounters that I potentially had planned for the next session. For example, we had a ‘6’ roll for the Twilight Lady (an Icon in my setting somewhat analogous to the Elf Queen) at the end of one session. The next episode was planned to be a dangerous trip downriver, with goblins ambushing the party with war canoes and archers on the shore – how could that relate to the Icon in play? Eventually I struck on the idea of a fey giant turtle surfacing from the river and aiding the characters (as the advantage conferred by the roll). This turned out not only to be a cool addition to the encounter, but also quite necessary to stop a potential TPK … as the battle was pretty vicious! As is obvious, it’s 18 months since the last post on this blog. Pretty much dead then? The honest answer is that at times I pretty much thought so. Due to 2 years of A-levels and GCSE exams in the house, no D&D was being played, and quite frankly, motivation for any sort of writing, or mapping, or gaming, just wasn’t there. So much so that although I subscribed to the 2016 Cartographer’s Annual from Profantasy.com, which I’ve blogged about many times, even doing a whole year of monthly maps in 2013, I recently discovered that I’d never even downloaded an issue! Whenever I had some time (rare…) and thought about doing some writing, I just couldn’t get going … I can’t realistically blame the lack of playing, as I’ve had many periods in my life where no gaming was happening, but it had never stopped me creating before! I’ve posted before about the 4E solo campaign I’m running occasionally (very occasionally as it happens…. doesn’t life just get in the way!!) for my son, called the Amber Pendant. His character has been called upon to embark on a quest for this relic of a bygone age, which has been stolen by agents of the Conclave of Dark Amber, one of the villainous Icons (yes this is 4E with 13th Age spice) of my Tolrendor setting. So, a little while ago I commissioned (aka asked nicely…) my daughter, now 16 and studying A-level Fine Art, for a painting of the Amber Pendant … and here you have the result!! Love to hear your views in the comments. It seems an age since I really got my teeth stuck into a proper map e.g. 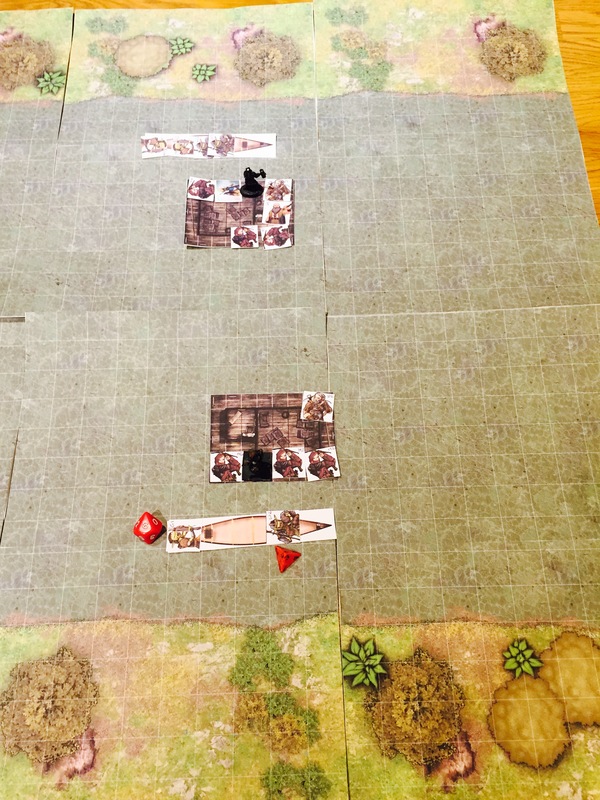 one which wasn’t just a quick CC3 hack to print out a scale battle-map. 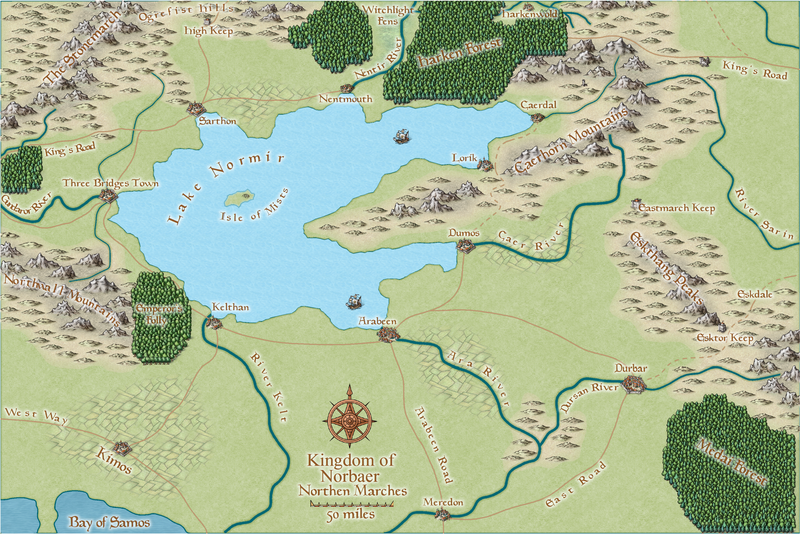 For my ‘Amber Pendant‘ solo campaign with my son, I needed to start detailing the northern borderlands of the Kingdom of Norbaer, as his character would be travelling through this region on his quest. In Tolrendor, this area is just to the south of the Nentir Vale (where my ‘Amber Tower‘ campaign is taking place) from the 4E source-books. I decided to use the ‘Mike Schley Overland‘ style, which comes with CC3+ Beta, the new version of Profantasy‘s premier map-making program. Although I’ve had this installed for some time, I’ve hardly touched it, so that was a good incentive as well. CC3+ was great to use: much faster than its predecessor, and very able to cope with leaving sheet effects turned on the whole time, as promised! In CC3, doing this was usually a recipe for white screens and frequent crashes. I also really liked the tool prompts displayed with the cursor, so you weren’t continually looking to the bottom of the screen for options. Of course, the proof of the pudding is in the results, and here I am also very pleased with this style; in fact it may just have got to the top of the list of my preferred styles for area maps. Nice soft colours with excellent blending and effects, great bitmap symbols, and especially, gorgeous forests combining the simplicity of drawing tools with symbol fills. A really fun encounter in my ‘solo’ campaign session with my son today. His character, with a few accomplices, is travelling down-river on a merchant’s barge in pursuit of some nefarious folk who have stolen an ancient artefact known only as the ‘Amber Pendant’. Note that this is me bowing to the inevitable and going back to physical maps and figures at the table after my experiments with alternate technology solutions. Another icon to (hopefully) whet the appetite for adventures in the Havenscoast, this one a powerful and ruthless pirate lord with some dark and dangerous secrets. Certainly when I started my 13th Age Campaign ‘Eyes of Watch’, this icon attracted a lot of interest in terms of both relationships and backstory. Today I hit 10,000 words out my 50k target, yay!! A long time ago, I started ‘The Havenscoast Project‘, an attempt to bring my ancient game-notes from the ’80s forward into ‘modern’ D&D terms, and to publish them on this blog. At the time, I was using 4E D&D. Although I managed to publish a few maps and notes, this had rather faded away. One of the key ‘hobby’ goals of my sabbatical leave was to kickstart this effort, although the project has now morphed into 13th Age, in line with the new campaign I recently started in the Havenscoast. 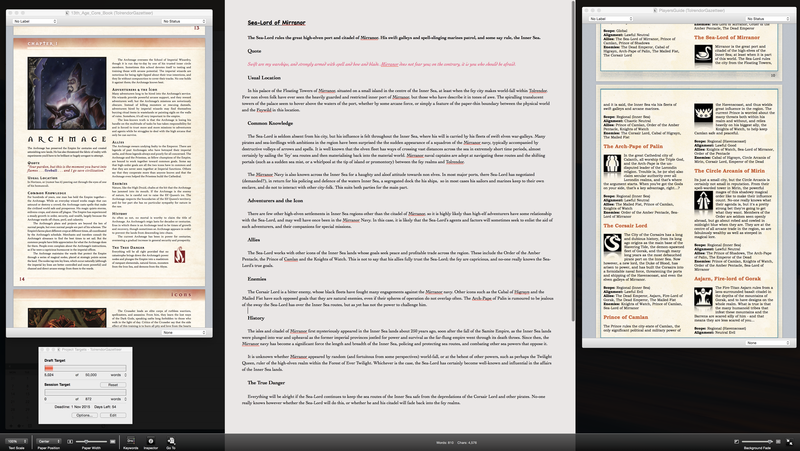 The target is to finish (at least) a draft of a complete ‘Havenscoast Gazetteer’, approximately 50k words/100 pages. Assembling all the work I had done already got me to about 4k words, so there’s plenty left to do! Along the way, I’ll be sharing a few snippets. The first is shown below, another of the Icons of the setting: The Sea-Lord of Mirranor. I may well cover this app in a bit more detail in an RPG Tech Talk post, as it has some really great features! Prep time for sessions is always at a premium. Even right now, when I’m on sabbatical leave from work, it seems to take a big chunk of elapsed time to get myself ready for a new session. Of course, this could be due to the fact that I’m trying to make progress on 3 campaigns at the moment, but regardless, I’m always looking for tricks that make prep smoother and quicker. The first attempt was in the 4E (with a 13th Age riff) solo campaign that I’m running for my son. Only two of us I thought, so why not use roll20.net as our game board, to save me the work of printing out maps/tokens, mounting maps etc. 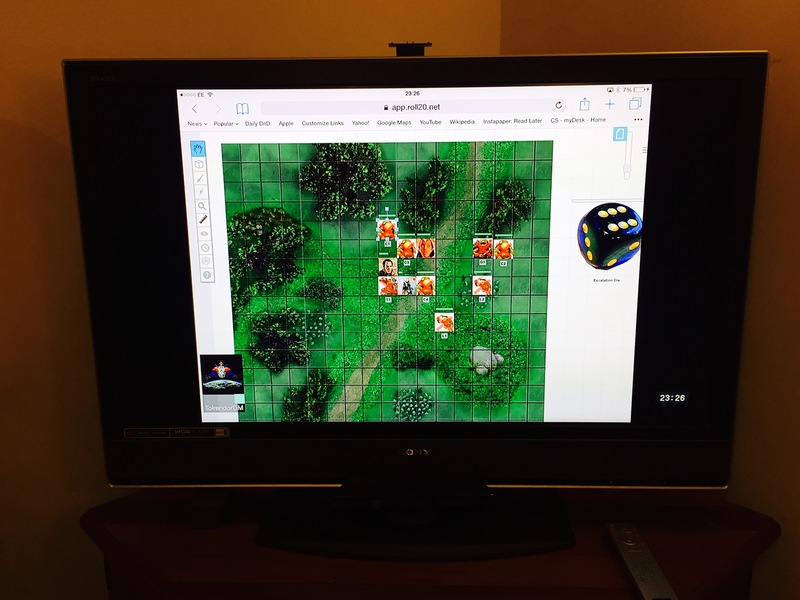 I used my laptop (behind the DM screen of course…) for DM control, and my iPad ‘air-played’ to the TV for player control. Did this work? Well, technically it worked fine, except for a few annoying instances where the AirPlay just dropped out. The monsters were easy to control from the DM’s laptop, and the lag (internet round-trip to roll20 and back) was pretty short. From a gaming perspective however my son was less than impressed. Basically, as I’ve mentioned before, he likes the physical props of the game, and the lack of a real map and tokens just didn’t work for him. He tends to pore over the map, looking at tactical options etc, and didn’t feel the ‘connection’ with the TV screen or iPad! A bit of a disappointment to me, as it certainly had been a dream to prep solely in the digital domain! I also very much like the ‘fog-of-war’ functionality, where you can reveal rooms one-by-one as the party enter them. For example in the Amber Tower campaign, the party is currently running through Thunderspire Labyrinth, attacking the Duergar stronghold of Horned Hold. The whole complex is a lot larger than the areas where encounters take place, so printing and mounting a full map seemed out of the question, and in any case would lead to all sorts of issues with ‘covering up’ areas that had not yet been explored. Clearly however, I needed to provide a physical combat map! As a second experiment, I went for a hybrid approach, as shown on the right. 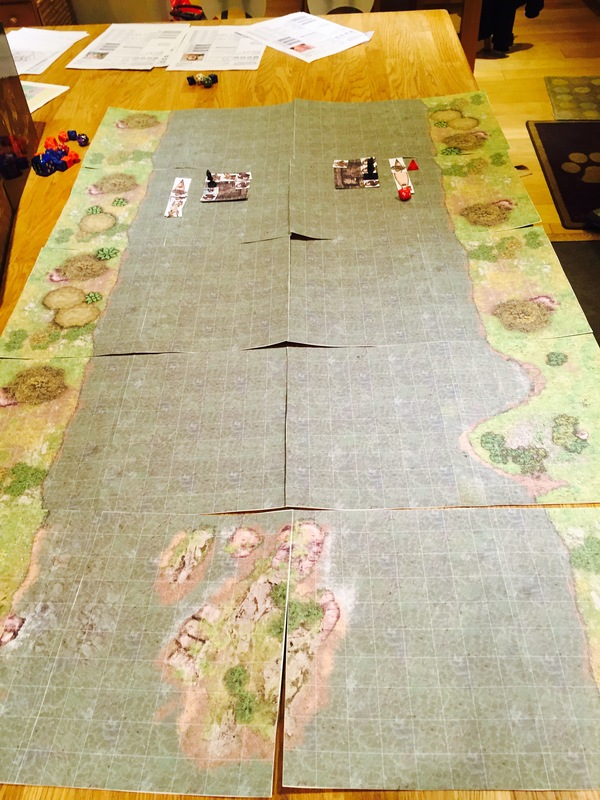 I used a large screen computer at our normal gaming table to display a players’ view of roll20.net. 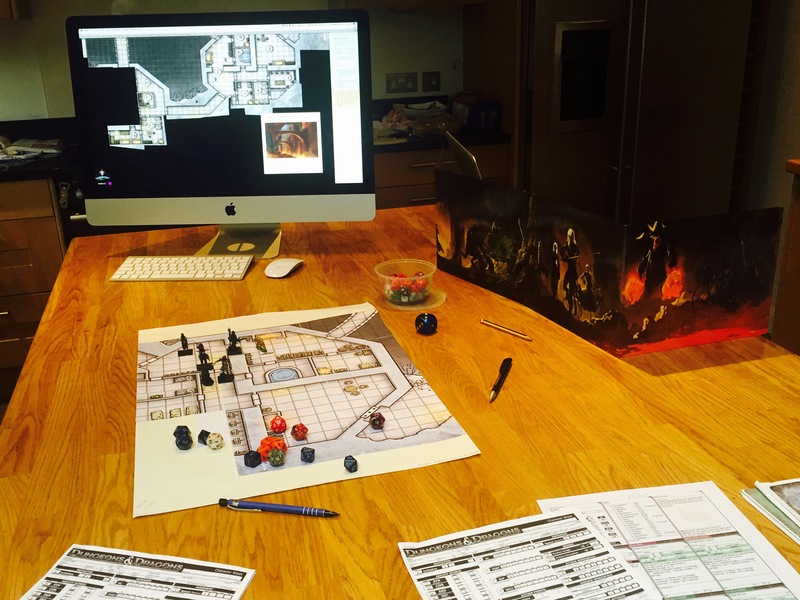 This allowed me to control the entire dungeon map from my laptop, revealing areas as the party moved around, and was also great in being able to show images and handouts on screen (such as the view of the Horned Hold at the bottom right). When the party ran into some Duergar however, I brought out onto the table a printed scale map for the smaller area, and we ran with figures and tokens as normal. This approach worked really well, and was approved by the kids! We’ve used it successfully for two sessions, and it looks like becoming a regular style. What it doesn’t solve of course, is the need for me to produce physical ‘assets’ for each game session. I’m not sure what the solution for this is, at least until gaming tables become affordable large flat horizontal touch screens with figure recognition 😉 The tech for this clearly exists, but probably not yet at consumer prices!